Summary of the project: I worked in Varanasi, India for one month developing communications to raise awareness within the rickshaw driving community of a route out of debt and constant rent through the work of SMV Wheels and the vehicle ownership they enable. 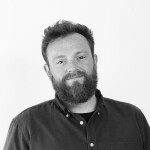 Tom is a Copywriter at award-winning London advertising agency Grey. At Grey, Tom works across a wide number of clients that we see in all areas of life, from beer to painkillers. His day to day work involves creatively concepting communications for brands, then presenting these concepts through succinct copy and design. No day, and no task is the same, which is just perfect for Toms’ restless mind. In his experience, a problem can take many forms, and the solution isn’t necessarily found an obvious place. Tom was born in Wales, and grew up in the Yorkshire Dales, with a few years spent in Brighton and California for good measure. Tom’s love for writing eventually brought him to Advertising. Before he found ‘AdLand’, via his 1st class degree in Creative Advertising, Tom worked in photography, childcare, charity fundraising, and a butchers shop. It has been a varied path so far, but he likes to think that those ‘real life’ experiences add a few (mismatched and random) strings to his bow. Tom’s mother has recently become a doctor of Sociology, with the specific focus of Volunteer Tourism. Tom was very close to his mother’s thesis, proofreading it numerous times, and acting as a research ‘guinea pig’ with 6 weeks volunteer work in Cambodia. From this he has a gathered an insight into the benefits and problems a volunteer experience can present, and is keen to use his placement to put his mum’s learnings to good action. His passions outside of the creative problem solving he gets paid for include motorbikes, food, and travel, amongst many other things. All of which are making him even more excited to be involved with the TIE project. Tom went to Varanasi, India, to work with a social business called SMV Wheels in February 2016. SMV is the first initiative of its kind: their work is improving the lives of hundreds of rickshaw drivers and the environment. Tom helped them with their branding and strategy. Find out more about the project here and watch his case study film.